Microsoft Outlook Training Ottawa - Learn with the best! Focus on what’s important. 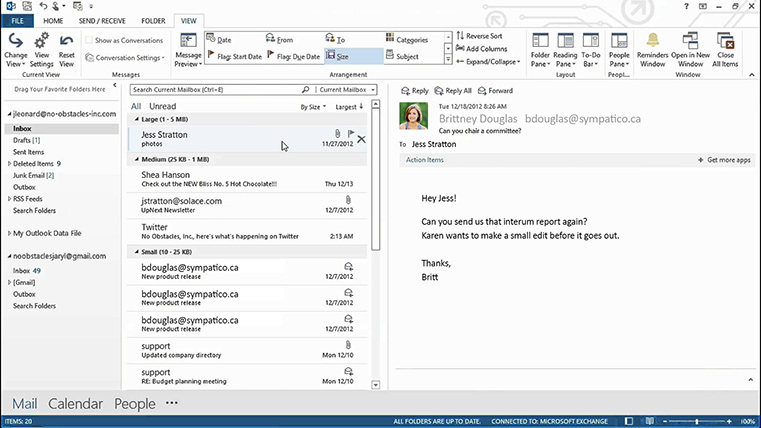 With Outlook 2013 you see everything you need to know at a glance—email, calendars, contacts, lists and notes are all coordinated and working for you. Our Training will get you ready to use Microsoft Outlook quickly and efficiently. In this class, you will learn to send and receive e-mail, to work with contacts, calendars, task lists, notes, and the journal. You will connect to your social media, cloud, and other mail accounts and we’ll give you tips on how to quickly and efficiently read, organize and send your mail.